NOTE: We are currently setting up and testing the shopping basket, so send email if you would like a button added to a specific item. All items are currently in stock and used unless otherwise stated. Inventory Price List price .loc . 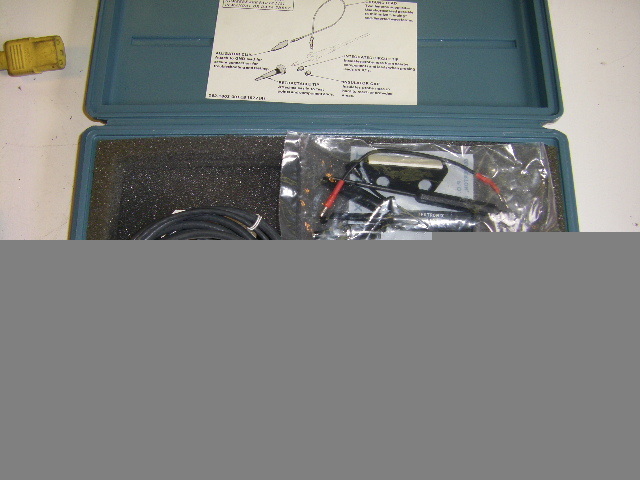 tektronix 134 current probe amplifier 100 . .
Tektronix 134 P6021AC current probe and amplifier 294 . .
tektronix CT-5 current transformer (in box) 375 dd1 . tektronix A6302 current probe (sold with AM503) now in stock 625 1 .
tektronix A6303 current probe now in stock! SPECIAL! 849 now in stock. tektronix P5205 100 MHz Differential Probe to 1300V call . .
tektronix P6010 010-0201-00 complete set (NEW) with 010-0200-00 probe 100 .
tektronix P6013A 010-0181-01 UHF probe w/ case & manual 400 132.
tek. P6020 010-0197-00 ac current probe 225 .
tek. P6023 010-065 10X adjustable probe 175 . .
tek P6028 opn 003 1X probe 100 . .
tektronix P6034 gr probe 125 1. .
tektronix P6041 CT-2 current trans + cable + 011-0049-01 termination 275 SOLD . tektronix P6046 differential PROBE complete kit 275 . .
tektronix P6047 word recognizer probe call . .
tektronix P6048 PROBE 125 . .
tektronix P6052 PROBE 100 . .
tektronix P6053B PROBE 100 . .
tektronix P6055 PROBE 250 . .
tektronix P6062B 10x or 1x 100Mhz switch-able used 100 . .
tektronix P6063B 10x or 1x 100Mhz switch-able 100 . .
tektronix P6101B PROBE 15 MHz probe 55 . .
tektronix P6102A PROBE 10 Meg 31.2 pF 10X 2M 100 . .
tektronix P6106A 10 Meg 11.2 pF 10X 250 MHz 100 . .
tektronix P6108A PROBE 10 Meg 11.2 pF 10X 2M 100 . .
tektronix P6109 PROBE 150 .
tektronix P6120 10 Meg 14 pF 10:1 100 . .
tektronix P6121 10 Meg 11 pF 10X 1.5 m 100 . .
tektronix P6122 10 Meg 11 pF 10X 1.5 m 125 . .
tektronix P6134C 10x ID for 11000 150 . .
tektronix P6133 PROBE 10 Meg 10.8 pF 1.3M 125 .
tektronix P6136 PROBE 10 Meg 10.8 pF 1.3M 350 MHz 150 .
tektronix P6137 10x ID 10.8pF for 2400 400MHz 180 . .
tektronix P6138A 10x 400 MHz 300v cat II for TDS400 200 . .
tektronix P6139A 10x 500 MHz for TDS6/500 250 . .
tektronix P6201 fet probe *see 1101A 294 . .
tektronix P6201A fet probe (2 avail) *see 1101A call . .
tektronix P6202 PROBE 150 . .
tektronix P6302 current probe (see AM503) 575 . .
tektronix P6303 current probe (see AM503) 750 1 .
tektronix P6451 010-6451-03 data acquisition probe 100 . .
tektronix P6452 data acquisition probe (qty avail.) 125 dd1 . tektronix P6452 ext. clock probe (qty) 125 dd2 . tektronix P6453 010-6453-00 probe call . .
tektronix P6455 TTL/MOS pat. gen. probe 125 . .
tektronix P6460 data acquisition probe (4 left) 400 dd2 . tektronix P6461 data acquisition probe (2 left) in orig. boxes 400 .
tektronix P6464 pattern generator probe (2 left) 450 dd1 . tektronix P6486 high sped ACO probe 194 . .
tektronix P6601 temp. PROBE 75 . .
tektronix TCP202 DC to 50 MHz current probe, +/- 1% to 3% accuracy. Max DC + peak AC current 15 A. Peak pulse current 50 A. 10 mA/div. sensitivity. LIKE NEW! -image- 1249 . .